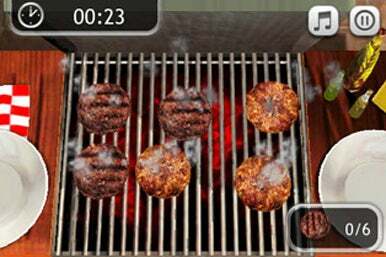 Developed by Gameloft, Pocket Chef is a cooking simulation game for the iPhone designed for the cooking-impaired. The app features 25 different recipes, some of which need to be “unlocked” by completing simpler and more familiar recipes. Each recipe requires a variety of different cooking skills that manifest themselves in mini-games with handy introductory tutorials. Pocket Chef tasks its players with cutting onions, stirring curry spices, spreading glaze on bread or deep-frying chicken at any given time. Each mini-game is pretty easy to get the hang of, and as you advance to more complicated recipes, the tutorials found earlier in Pocket Chef gradually disappear. An instant cooking mode allows you to easily re-cook any recipes that you have already unlocked. All of the excitement of grilling burgers! Right on your iPhone! The game plays like an iPhone advertisement—Pocket Chef takes advantage of the double-touch so you can open cracked eggs and uses the internal accelerometer to let you flip items in a sauté pan. I’m ok with the slight overuse of gimmicks, but it makes it difficult to discreetly play your game when you’re tilting melting butter in pans and stirring big bowls of eggs and flipping flapjacks. My warning to bad/inexperienced cooks: do not go try to cook a five-course meal after playing a few rounds of Pocket Chef. The little cooking mini-games are in no way realistic portrayals of the right way to cook food, I assume partially so that the game can be more accessible and partly because real cooking is time consuming and boring to watch. Pocket Chef does offer a recipe book, but at only 25 recipes, Pocket Chef can’t compete with real recipe apps like Whole Foods Recipes or Epicurious Recipes, both of which have more recipes and are much cheaper than Pocket Chef’s $4.99. Though not a game that's going to teach you to cook, Pocket Chef is a fun, graphically impressive, and clever casual game. Pocket Chef will make for a fun distraction for those who want to learn how to cook but never will, and for everyone else, it might be more filling to keep your $5.00 and order in Chinese food.